Submitted by lynn on Wednesday, April 11, 2012 - 11:09pm. The lunch crew decided to try out a new place called Anny's Fine Burger which replaced a thai restaurant they had previously dined. From the staff I found out it had been open for 3 weeks. From the internet I found an original location in Santee and NO information about the new Kearny Mesa location on their website. Time to update folks! Back to the important part though... the food! I was originally looking for a portobella mushroom burger but alas, this place has only one vegetarian burger option. I selected the salmon steak burger, which just felt like the 'healthy' choice. 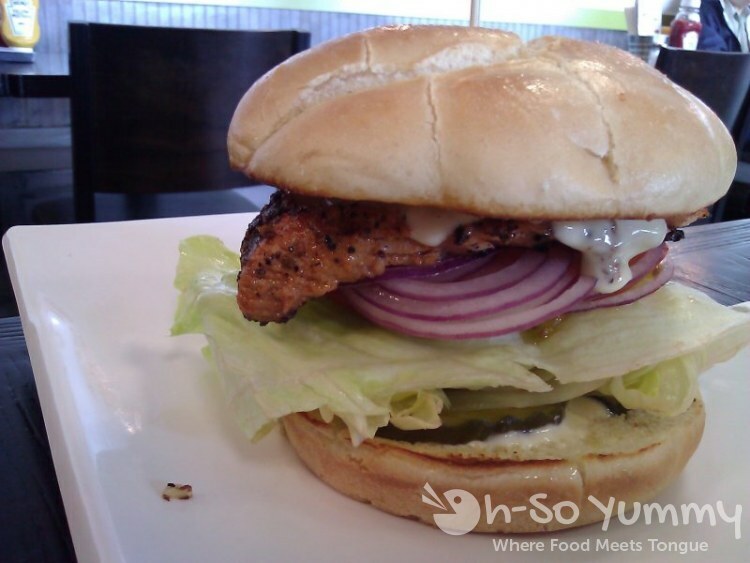 This is #25, the Salmon Steak Burger ($7.50). My biggest worry with eating fish steaks is dry and flavorless but this was not the case! It was definitely a nice juicy salmon steak with fresh crisp lettuce. As you can see in the picture, it did contain a good amount of lemon mayo sauce that created a drippy mess on the plate. I liked the nice buttered crunch of the 5" kaiser roll that encased the sandwich. Overall, a yummy sandwich that I'd purchase again but maybe with less sauce! This is #24, Santa Fe Burger ($6.50). This was also a healthy choice with a grilled chicken breast instead of a beefy 1/2 lb patty. It too left a sauce trail of buttermilk ranch dressing on the plate. 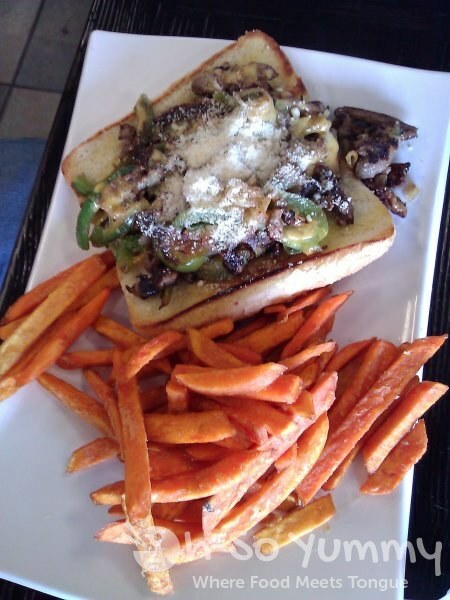 This is #30 BBQ Cheesesteak ($6.50) + fries. 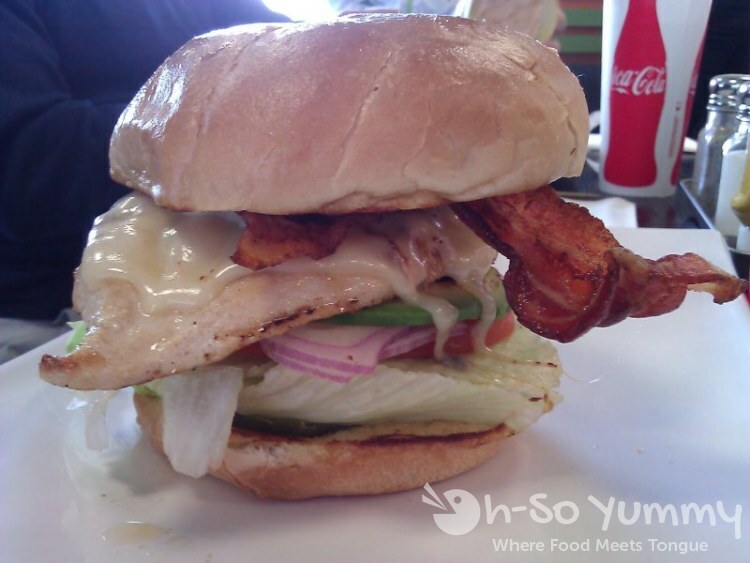 This diner noted that the korean bbq flavor was very weak but overall a sizable sandwich. We both agreed that the fries did not impress much... they needed some seasoning! Sorry for the bad angle picture. I didn't want to inconvenience my coworkers on their lunch. 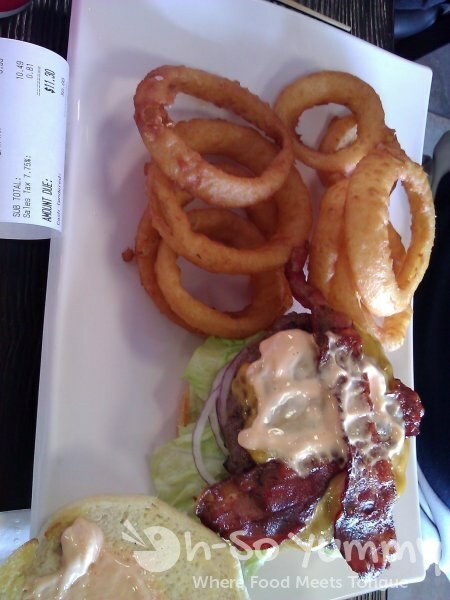 This is #3 Bacon Cheese Burger ($6.50) + onion rings. I'm not sure how messy this one was but this diner had no big issues with it. I got to taste the onion rings too, which were softly battered but still had a little texture and pleasing flavor. I like them non-greasy too! So in the end, is this place a keeper? Possibly after some more sampling. The food came out relatively quick and I enjoyed my sandwich so if anything I'd be down to order more salmon. I hope they eventually do a tasty mushroom burger though. Currently it's not much of a vegetarian friendly place!